Sea Ray designs, manufactures and markets boats ranging from 17 feet (5.2 m) power cruisers to over 65 feet (20 m) yachts, including the Sundancer brand. One of the first recreational boat manufacturers to build using fiberglass, Sea Ray began operations in 1959. Building sport boats, premium motorized cruiser and yachts which are the recreational watercraft market targeted by Sea Ray. 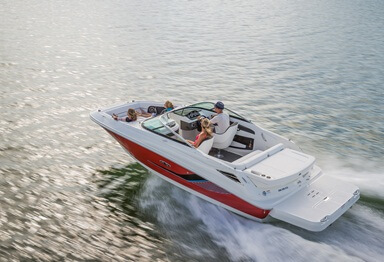 Currently part of the Brunswick Corporation, Sea Ray is dedicated to "superior quality fiberglass boats." QuietRide™: Reduces noise, vibration and harshness (NVH) by up to 50%, so conversation are easier, fatigue is reduced, concentration is enhanced. TabletTunes™: Comprehensive multimedia solution that provides intuitive control of a variety of entertainment devices in one easy-to-use touchscreen. Sea Ray is the first production boat manufacturer to offer this program. Dynamic Running Surface™: With the push of a button, skiers and wakeboarders can define presets to shape the perfect wake height. Large, triangular planes create an articulated running surface that improves acceleration, reduces bow rise and keep the boat at optimal trim. If you're the type that likes to buy *new* things, learn more about their popular models below. If you prefer saving money, scroll down a little further. Using every square inch, the deck layout maximizes usable space by seamlessly integrating storage into the social zones. Aesthetically, the 220 Sundeck's curved profile doesn't just please the eye, it also enhances comfort, maneuverability and storage. 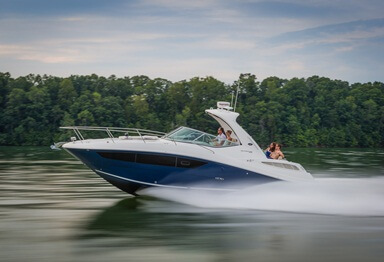 The 260 Sundancer was designed to encourage long days on the water. The numerous amenities, such as the spacious cockpit and cozy V-berth, ensure you are comfortable no matter the situation. Excellent Sundancer! Twin 4.3Ltr V-6 Mercs! New Bottom Paint! Camper Top! Cockpit Cover! Windlass! 3 New Batteries! Always Fresh Water! Dual Trailer! Excellent condition 215 Express Cruiser! Low hours! Meticulously maintained! Loaded and ready to cruise! Nice Sea Ray 280 Sundancer Express Cruiser!! Repowered!! Twin Mercruiser 5.7 L 250HP!! LIFE IS GOOD!! VERY NICE SEA RAY EXPRESS CRUISER WITH DUAL BIMINI TOPS, LARGE EXTENDED SWIM PLATFORM WITH WALK THROUGH AT THE TRANSOM AND MUCH MORE!!! Powered with twin Caterpillar diesel engines ready to go! Live life in comfort with this beauty! PROFESSIONALLY MAINTAINED AND SERVICED!!! GREAT CONDITION, TRAILER INCLUDED!!! Sundancer 300 in amazing shape! Plenty of power from dual Mercruiser 260 V8s, both have been rebuilt!